The 'Off-Centered Society' is an opportunity for us to not only see more of our off-centered evangelists, but keep them in the know about upcoming happenings and reward them for the time they spend at our coastal Delaware properties. 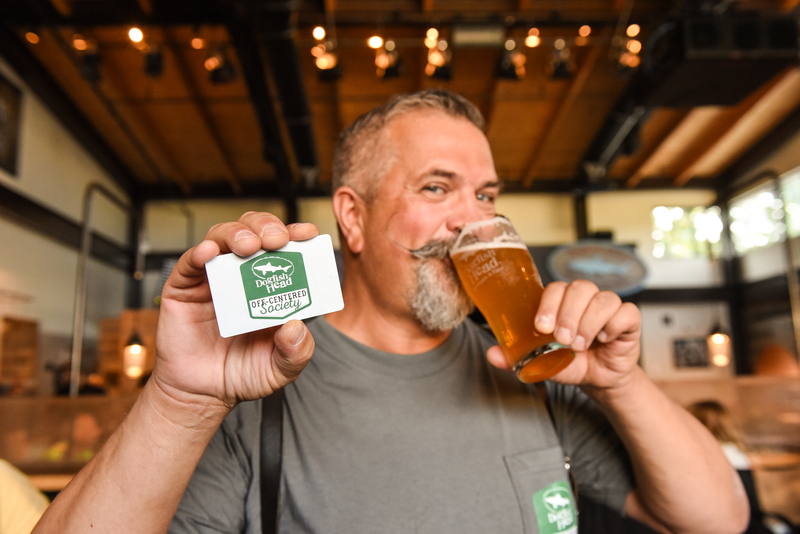 It's a program that allows folks to earn and redeem points for purchases at our Milton Tasting Room & Kitchen, Brewings & Eats, Chesapeake & Maine, Off-Centered EmPOURium and the Dogfish Inn! Intrigued? Keep reading to learn how you can join us on this exciting new journey! You can sign up to be part of the ‘Off-Centered Society’ at any of our coastal Delaware properties for an annual membership fee of $25. Upon enrollment, you’ll receive an ‘Off-Centered Society’ card and free, limited-edition T-shirt. For every dollar you spend at one of our coastal Delaware properties, you’ll earn one point, and for every 100 points you earn, you’ll get a $10 reward* to be applied to a future purchase of $20 or more. And to track your points and view your available rewards, all you've got to do is visit offcenteredsociety.myguestaccount.com/guest/ or download the ‘Off-Centered Society’ mobile application. We’re thrilled to introduce you to the 'Off-Centered Society' and hope you’ll join us on this exploration of goodness! Enrollment is now open, so head on over to one of our properties and get yourself signed up! *Each $10 reward entitles you to a $10 discount on a purchase of $20 or more.